If I told you that there once existed a man who had himself sealed inside a car for over a year while trying to drive to all 48 contiguous states, and then, after not quite managing that, decided to try to collect pajama bottoms from every U.S. governor, you’d very justifiably think I was some loon making things up. But while you may be right about me being a loon, you’d be wrong about the making things up part. That’s because the man I described was real, and his name was Don Haynes. 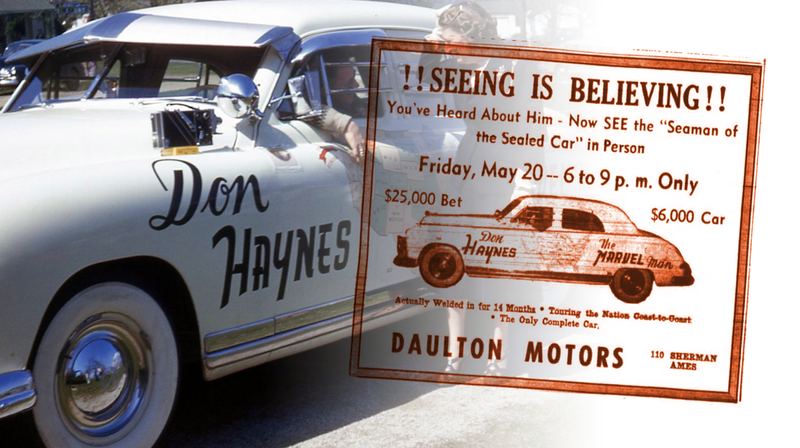 The Don Haynes story starts, like many good stories start, with a bet. In this case the bet was with a person that only seems to ever be described as “a local farmer,” though some sources suggest he was a rancher, possibly named Mulden or Mauldin—it’s not really clear, and I guess not all that important. The interior of the auto has hot and cold running water, a full length bed, chemical lavatory, collapsible bath, exercise equipment and even television. Haynes car, which is barred on all sides so that he cannot escape, is equipped so that he can enjoy some of the comforts of life while he is experiencing this strange and record-breaking venture. They include: hot and cold running water, chemical lavatory, collapsing bed and mattress, radio, record player, public address system, cooking facilities, folding bath tub, electric shaver and blanket, exercise equipment, bureau, and many other conveniences. Haynes, now calling himself “The Marvel Man” and a name all but guaranteed to make every teenaged boy giggle like an idiot, “The Seaman of the Sealed Car,” also had a support vehicle to follow him around, help arrange publicity visits, and lend general assistance of all the types you’d need as someone trapped inside a car. 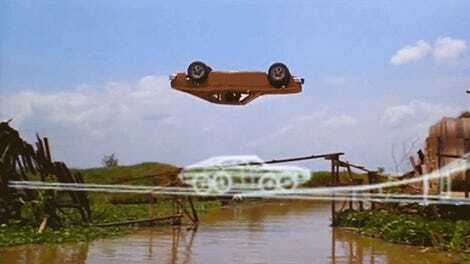 There were rumors that the car had removable floorboards so that Haynes could sneak out for periods of time, but this has never been confirmed. Or refuted, for that matter. The trip seemed pretty eventful for being stuck in a car. In Los Angeles, it’s reported that Haynes attempted to “purchase a monkey for a companion,” and, most incredibly, he returned to Ashland, Orgeon in April of 1949 for the birth of his daughter. To see his wife and daughter, Haynes arranged for his Kaiser to be craned up to the window of his wife’s hospital room. With the insane amount of dedication and effort it seems that Haynes took to pull off the stunt (and win the $25,000 bet), it’s sort of surprising how this all ends: He failed. Even though he was tantalizingly close to finishing the task and winning the bet, in March of 1950 Haynes returned to Oregon and was cut out of the car, ending his adventure. It’s not clear exactly why Haynes quit, beyond the reasons why anyone would want to get the hell out of a presumably very smelly Kaiser they’d been in for over a year. Some say it had to do with the loss of his support vehicle, but nothing is really certain. What is known is that just four months later Haynes had embarked on a new quest: to get pajama bottoms from every governor of all 48 (this was pre-Alaska and Hawaii, remember) states, which would then be made into a quilt that would be auctioned off to support the American Cancer Society. It only appears one governor gave up his pajama bottoms, Iowa Gov. William S. Beardsley, which, no matter how big he may have been, probably wasn’t enough for a whole quilt. Later, in 1958, Haynes gave the whole sealed-in-a-car gambit another go, this time with his wife sealed in with him in a Mercury Voyager wagon, pulling a trailer that allowed a couple that was following them to cook for the trapped Hayneses. A postcard from the era shows the car and the Avalair trailer, and they seem to have some sponsorships, including FrigiKing air conditioning and Turbocraft, which was a boat company. I haven’t heard that a boat was involved, though. This attempt was to have taken 18 months, and Haynes claimed it was all happening because of a bet with author and radio (and later television) personality Art Linkletter, whom he also claimed was making a movie about him. It’s not clear if Haynes and his wife finished the drive, though there’s a report from 1963 that shows Haynes was in a minor accident and was treated through the car’s window bars, and that a judge came to the car to charge him with failure to yield. Not much is known about Haynes after this point, which is a shame, since he was clearly an energetic, driven person, and deserves at least some kind of place in automotive history. And possibly gubernatorial sleepwear history.